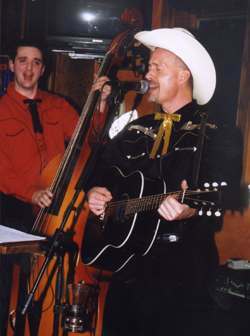 Cyr, rhythm guitarist Thomas, and lead guitarist/pedal steel player Bobby Rivera had all briefly interacted in previous units – Cyr and Thomas in the Rustbelt Boys ; Thomas and Rivera in the Riverwesterners; and Cyr and Rivera in the Uptown Savages. Each had tried to integrate more vintage country sounds with their previous groups. “We did some stuff in the Savages at first,” said Rivera , “but it was phased out.” Part of the problem, Cyr noted, was instrumentation. “But with our current instrumentation, we can pull off the songs much better now,” he said. The Starlanders are working towards a full-length CD, but want to ensure that it fully represents the group’s talents. “We need to add more original tunes,” Cyr said. “We’re not opposed to covers, but we want the CD to be 90% originals. Very few artists have been successful playing just covers.” Cyr and Rivera are working on many of the tunes, but don’t emphasize their efforts individually. “We want to do it where everything’s co-written,” Rivera said. “I’ve been in groups where the song comes in finished – lyrics and melody. Here, we just let the song progress as we rehearse; it can develop in practice.” But along with the fun they have, Thomas and his band mates have a noticeable intensity about them. “It can get hectic, but we’re really focused on developing more of our material,” Thomas said.